"molecules magnified," revealing details of the macabre (that have essentially become the new way of life) experienced by people, plants, and animals. There is no large-scale panic or rage. Rather, each poem is a quiet horror story, where the grotesque is often interspersed with quaint and beautiful lines such as, "I will sing/ [a song] into your mouth/if it would comfort you," or "a newborn animal/ shakes the dust off itself/ and stands, makes/ a thimbleful of sound." All the poems are intricately tied together, not only in setting and tone, but through the same ideas and images that run throughout the book like ligaments connecting bones. The idea of chambers is reiterated in several pieces. In "Purgatory," the chambers are the porous bone of a deer's femur, which the persona saws in half to "glimpse the glow/ of the honeycomb/ dripping through it." Chambers appear again in "The Last Przewalski's Horse," as a hunter "cuts away the glistening red web of matter around the heart." Further, in "Archipelago: Tabula Rasa," the island is "a curved honeycomb" where cleansing takes place, where "[t]he bees crawl into my ears to begin their work. They burn inside me like many stars, and all the tiny tombs inside me open, and each chamber is lit clean." These chambers within the femur, honeycomb, web and body underscore the theme of microcosms, and are themselves symbolic of chambered catacombs, or "crypt[s] beneath a church/ at the end of a century, when the people/ have begun to think of the bodies/ as truly dead and unraiseable." 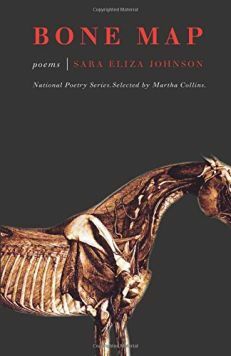 Although Bone Map is Johnson's first collection of poetry, she is no amateur. Each word, line, and image has a specific purpose. Even the spare parts have a purpose-much like the horse's eyes the hunter leaves in the field in "The Last Przewalski's Horse," that are "no use to anyone" but actually become food consumed by the flies. What may seem spare in one poem becomes a central theme of another as the same images recur, suturing the individual pieces together. Among other recurring images are light/darkness, frost, milk, berries, bees (whose swarming is reminiscent of the war and its drones), skulls, holes (bullet holes, cavities, wells), rot, the color purple, wounds in the palms of hands, microscopic elements (atoms, molecules, cells, photons, dust), and heavenly bodies (stars, planets, moon, sun). All these work together to create an organic work of art. The language is so controlled in what should be chaos that the poems are thick with a profound eeriness, making it difficult to sleep in the days of their aftermath. Some advice before you open Bone Map: "walk back to the house, through the garden/ of skeletons, to get the sutures/ and gauze from the medicine cabinet—/ you will need to use them before the hardest work is done." Michelle McMillan-Holifield studied poetry and creative writing at Delta State University in the Mississippi Delta. She is currently working on her MFA at the University of Arkansas, Monticello. Her poetry has appeared in PMS poemmemoirstory, Lullwater Review, and Deep South Magazine.